Playing potentially lethal games with express trains may not be everyone’s idea of fun, but for the eponymous 12 year old boy it’s where he can feel some rare companionship with his peers. It’s also safer, than being with his father. For the boy, nicknamed El Bola (Pellet) after the lucky ball bearing he always carries, is a victim of serious physical abuse at the hands of his dad. The lad (Juan Jos Ballesta) fears the vicious beatings and his isolation at home is echoed at school where he actively avoids from forming friendships, the better to hide his shame. His luck begins to change when a new boy arrives in his class. Alberto (Pablo Galán) is friendly and doesn’t judge El Bola. Alberto’s family is the opposite of his pal’s – warm and welcoming. His dad, a tattoo artist, leaves permanent marks on his willing clients’ skin in contrast to El Bola’s who leaves bruising, cuts and psychological damage on his victim. 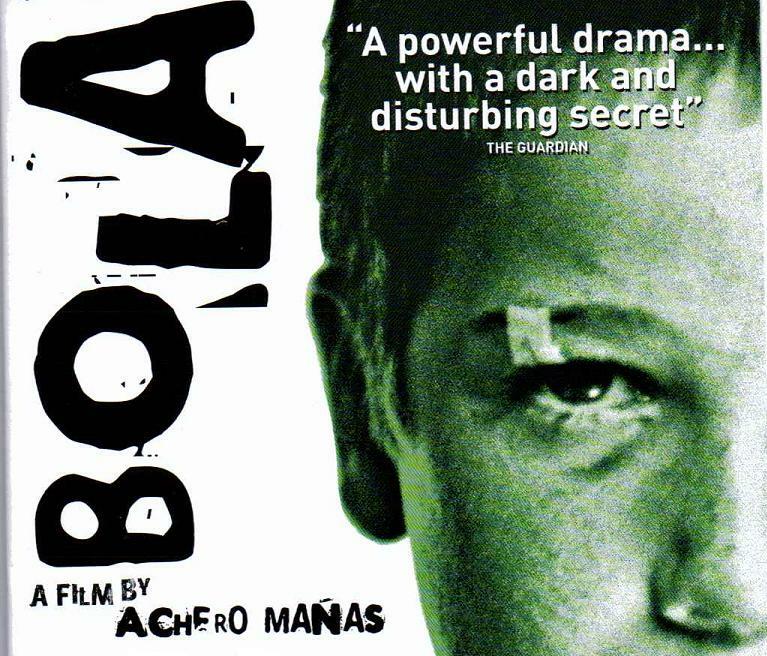 El Bola understands that Alberto’s family is unconventional but, faced with the unpalatable alternative, and the very real threat of death, he also understands that they offer something akin to normality. And that’s something he simply can’t afford to ignore. Faced with beatings at home, skulking around the streets of Madrid by day and night or the possibility of friendship and solace at Alberto’s flat, it’s an easy choice for the brutalised and vulnerable boy to make. Sympathising with the inherently likeable but crushed El Bola is unavoidable. This is largely due to the credibility of Ballesta’s performance as the put-upon El Bola combined with the strong support of Galán and two very different role models offered by the two radically different father-figures. But Mañas manages to avoid making his characters one-dimensional good or bad guys. A number of issues arise during the film which remain unresolved: the uncertain sexuality of the adult’s in Alberto’s life, for example, and the lack of clarity over El Bola’s future. But this perhaps reflects the need to get him out of harm’s way now rather than dwelling on matters that are of no real importance – he won’t have a future if he can’t escape from his father. Don’t expect clear-cut solutions or happy endings. Domestic violence is a reality for many kids in Spain and elsewhere but Mañas deals with a grim subject in a simple, credible way without offering simplistic moralising or solutions. Interesting review. You might liketo know that some free online Spanish language teaching resources to the film are available at. Hi Julian. Thanks for your comments, glad you find it interesting. Thanks for the resources too. Your site looks good! A person necessaarily lend a hand to make significantly articles I would state.